CONNELL, Wash. -- Orman Johnson and Kevin Lyle worry about the wells that pump water from deep within the earth beneath their Central Washington farms. Soon, they fear, there will be no water for their crops. Johnson and Lyle live about a mile from each other, and the flow of water from their wells is lower each year, Lyle said. "If they're producing at all," said Johnson, who is also chairman of the Columbia Basin Development League board. "The quality of the water is not as good, either. It's a high pH, high sodium." "They pump for a while each year," Johnson said. "In the spring they work. Some of them, I wait until June to start up. Some, it doesn't help." Fifteen to 20 years ago, Johnson's seven wells would provide 8,000 to 9,000 gallons a minute. Today, they pump a little more than half that, and less by the end of each season, he said. Like the more than 175,000 other farmers in the West, Johnson and Lyle depend on water produced by the massive natural and man-made waterworks that spans the region. Most water reaches the West as rain and snow through the natural water cycle, said Xochitl Rojas-Rocha, science communicator with the U.S. Geological Survey's Western Ecological Research Center. Their irrigation water comes from the Odessa Aquifer on the federal Columbia Basin Project. When the project first opened to farming in 1948, the plan was to tap the massive Columbia River for water. Use of the aquifer was intended to continue only until the river water was available. Now, nearly seven decades later, the aquifer is running out. Johnson and Lyle hope to replace the declining groundwater from their wells with water from the Columbia River. That could happen between 2019 and 2023, "if everything goes right," Johnson said. Can they wait until then? "Do I have an option?" Johnson said. "We need it today." The two farmers raise high-value crops such as conventional and organic potatoes, wheat, canola, corn, barley, seed peas, grass seed and organic onions, spelt, asparagus and mint. Without the water, Johnson and Lyle said they would likely have to raise dryland wheat every other year on their thousands of acres. The rain and spring and summer snowmelt flow into streams and rivers, but before it reaches the ocean, massive networks of dams, canals and pipelines divert a portion of it to cities and farms. In addition to natural sources of water, a $1 billion desalination plant is being pressed into service near San Diego in Southern California to treat ocean water and provide fresh water to nearby cities. The problem in much of the West is precipitation -- or the lack of it. "With maybe the exception of the coastal, temperate rainforests, the West, in general, is a desert," Rojas-Rocha said. "Precipitation numbers are much lower here than, say, the Midwest or East Coast." Most of the West's water supply is from aquifers, such as the Odessa, and from rivers. Three major rivers -- the Columbia, the Snake and the Colorado -- provide much of the region's surface water. Combined with the Klamath, Sacramento and other rivers, they supply trillions of gallons of water to the West each year. For example, the average flow of the Columbia River at The Dalles, Ore., which is downstream from its confluence with the Snake, is about 128 billion gallons -- a day. The average daily flow of the Colorado River is about 15.2 billion gallons at Lee's Ferry, Ariz., upstream from most of the major diversions. Much of the Columbia's water comes from snowmelt in the mountains of Canada and the Pacific Northwest. Its main headwaters are at Columbia Lake in British Columbia, Rojas-Rocha said. The Snake is the biggest tributary of the Columbia. Its headwaters are just inside Yellowstone National Park, Wyo. The Colorado River begins at LaPoudre Pass, near Grand Lake in Rocky Mountain National Park, Colo.
More than 60 dams provide flood control, electricity, navigation aid for barges and water for irrigation in the Columbia River watershed. The Snake River has 25 dams, and the Colorado River has 15 dams on its main stem and more on its tributaries. According to the California Department of Water Resources, roughly 50 to 60 percent of the state's surface water goes to the environment for fish and native vegetation while the remaining 40 to 50 percent goes to urban and agricultural uses. Besides the rivers, groundwater is a major source of water for farmers and cities. The U.S. Geological Survey does not track the total amount of groundwater available to the West, said spokesman John Clemens. The agency monitors supplies on a regional, county and snapshot basis, but the total amount changes over time and would not have any scientific or technical meaning, he said. In much of California, now in the fifth year of drought, groundwater has been a godsend. Parched portions of Central California and elsewhere rely on wells for up to 100 percent of the municipal and agricultural water, according to the state's Department of Water Resources. Overall, 38 percent of the state's total water supply comes from groundwater. In Idaho, an average of 22 inches of precipitation falls on average every year, accounting for more than 75 percent, or roughly 98 million acre-feet, of the state's water supply. Roughly half of that goes to vegetation or is lost to evaporation. The remaining 49 million acre-feet is surface water or goes to recharge aquifers, according to a 2010 report by Idaho Department of Water Resources. An acre-foot equals 325,851 gallons. Oregon's average annual precipitation is about 30 inches, but that varies widely, from as much as 200 inches per year at several points along the Oregon Coast Range to less than 8 inches in parts of Eastern Oregon. Oregon expects roughly 100 million acre-feet of water in an average year to fill lakes and streams and recharge aquifers, according to the Oregon Water Resources Department's Integrated Water Resources Strategy report. That doesn't include water that evaporates or originates outside the state. Only 9 percent is diverted for farms or other uses, according to the report. Washington doesn't measure its flow of water, since there's no purpose for the information, said Brook Beeler, communications director for the state Department of Ecology in Spokane. Instead, Ecology determines if water is available at a given time at a given location for various needs, such as people, farms and fish. For fish, the department determines the minimum instream flows needed to protect habitat, which varies by season, Beeler said. "In relationship to surface water we have flow data for many priority river systems, but we have more than 70,000 miles of streams and rivers -- not all of these are monitored or measured," Beeler said. "Like always, we could do a lot of stuff better, use water more efficiently, more cooperatively, but I think all in all, we live in a pretty good place," said Aaron Wolf, professor of geography at Oregon State University's College of Earth, Ocean and Atmospheric Sciences. He believes the Columbia-Snake River System is a "terrific" example of water being shared across nations, states and economic sectors. "It unites five states, a Canadian province, ranchers and environmentalists, ecosystems and tribes," he said. Michael Campana, professor of hydrogeology and water resources at OSU, specializes in sub-surface water and teaches classes on water management. "It's not like it used to be, but I think overall, given the tenor of the times and the fact global warming paints an uncertain future for us, farmers are in fairly good shape," Campana said. But forecasts call for warmer, wetter weather, which means more rain and less snow, Campana said. The snow that does fall will melt sooner, which requires more man-made storage for summer use. Campana expects junior water right holders and farmers growing low-value crops to be impacted most. "The days of 'I can take all of the water out of the stream I want' are long gone, and they're not coming back," he said. "The farmers are real easy targets, so when people talk about drought and cutting water use 25 percent, (they) look right away at the farmers," Campana said. "Sure, we need to cut out water use in the cities and tear out the green lawns and everything. If we don't like agriculture using a lot of water, we have a lot of decisions as stakeholders -- who's going to replace the food that is taken out of production, do we want to have to pay higher prices, do we want to truck or ship in food from the Southeast, which is wetter?" 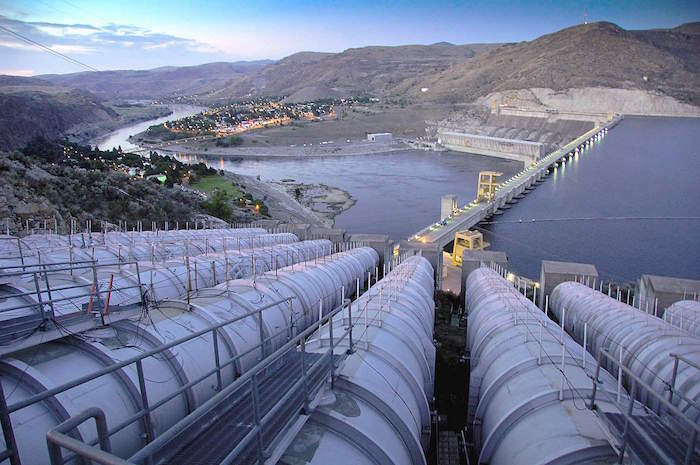 Johnson, Lyle and their neighboring Washington state farmers anticipate getting water from the Columbia River via the East Columbia Basin Irrigation District's planned pipeline. In the meantime, they wonder if their luck will continue. If they have an electrical interruption in June, there's a chance they may not be able to prime their well pumps again, Johnson said. "Every day we're concerned about how much water we've got the next day," Johnson said. "Every day when (we) go to sleep, we don't know if there's going to be a well shut off."